Go to the Discussion and Reading Group Guide! READ THIS: Click (with the left button of your mouse) on blue-coloured text to access pages! The narcissist is an actor enacting a monodrama, yet forced to remain behind the scenes. The scenes take centre stage, instead. The Narcissist does not cater at all to his own needs. Contrary to his reputation, the Narcissist does not "love" himself in any true sense of this loaded word. He feeds off other people who hurl back at him an image that he projects to them. This is their sole function in his world : to reflect, to admire, to applaud, to detest - in a word, to assure him that he exists. Otherwise, they have no right to tax his time, energy, or emotions - so he feels. The Narcissist's ego is weak and lacks clear borders. Many of the ego functions are projected. The Superego is sadistic and punishing. The Id is unrestrained. Primary objects in the Narcissist's childhood were badly idealized and internalized. His object relations are distraught and destroyed. The main body of research about Narcissism is surveyed. 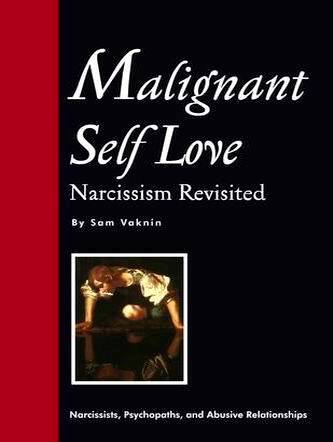 "Malignant Self Love - Narcissism Re-Visited" offers a detailed, first hand account of what it is like to have a Narcissistic Personality Disorder. It offers new insights and an organized methodological framework using a new psychodynamic language. Narcissism is a slippery subject: only with great difficulty can it be captured with words. A new vocabulary had to be invented to account for the myriad of facets and appearances - false and true - of this disease. Download the Primer and Glossary HERE! The contents of this website are not meant to substitute for professional help and counseling. The readers are discouraged from using it for diagnostic or therapeutic ends. The diagnosis and treatment of the Narcissistic Personality Disorder can only be done by professional specifically trained and qualified to do so. The author is NOT A MENTAL HEALTH PROFESSIONAL. The author is certified in Psychological Counseling Techniques. Free, unrestricted use is allowed on a non commercial basis. any reproduction of the material for any use and by any means. 1. Click here to find a specific word or subject: "Search My Site"
We will be glad to have your comments (see our E-Mail addresses above).